Ever since my children were old enough to go to Hebrew School, each year they asked me if we could build a sukkah for the fall holiday of Sukkot. 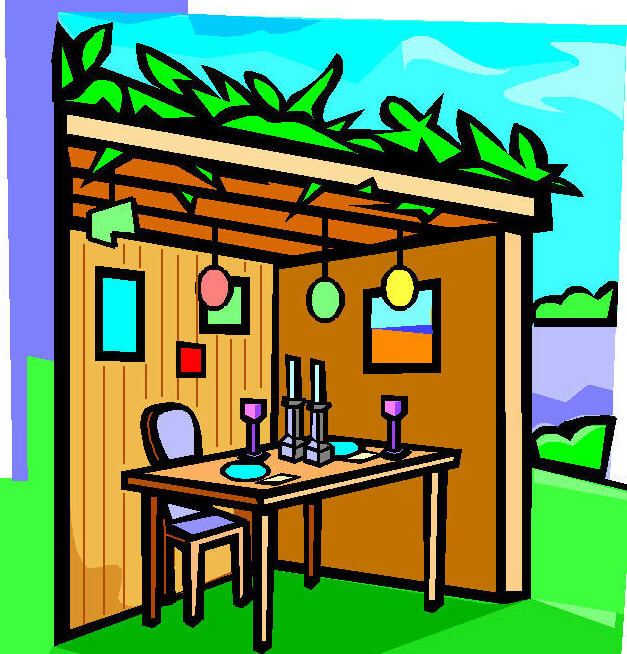 A sukkah is a small dwelling place --- a sort of glorified hut --- that Jews are supposed to construct and inhabit during the weeklong holiday instead of their comfortable homes with heat, indoor plumbing, and television showing the World Series. All things considered, however, being pushed for a sukkah beats having your kids constantly nagging you about getting a dog. A sukkah doesn't have to be walked at 6:30 in the morning in February and very rarely messes on the hardwood flooring. And since I did grow up having a dog but didn't have a sukkah, the idea frankly kind of appealed to me as well. I am the type of Jewish person who happens to be very mechanically inclined, meaning whenever any situation requiring fixing or repairing things presents itself, I am very inclined to hire a mechanic. It's the same with constructing things. I have given up in disgust attempting to put together a toy for children under three from McDonald's. "Guys, if we have our own sukkah, you won't enjoy the neighbor's sukkah as much." This was true. Our neighbor, a Jewish man who owned an elaborate set of power tools, built a tree house for his children, and I believe spent Sundays instructing Amish people in the art of barn raising, annually built a killer sukkah. Large, sturdy, bedecked in gourds, pumpkins, and sumptuous decorations acquired by the family over years, the neighbors' sukkah lacked only water spewing fountains to make it a secondary tourist attraction in the Philadelphia area. Then our neighbor moved away to a house with larger property where he could presumably build an even more grandious sukkah, and was replaced with a nice gentile family which spent appreciably less time each fall building a sukkah than turning their house each winter into Rockefeller Center. "Look, you guys," I said to the kids pressing harder for excuses, "we have kind of a smallish house and sometimes the roof leaks. That's just as good!" Finally, I relented. This would be the year my son Brandon and I would build a sukkah. The only problem now was that Brandon is every bit as handyman challenged as I am. This is a young guy who looks about for a plug whenever he is required to use a screwdriver and operates a pair of plyers by blowing on them. So we sought out some kind of more or less ready-made sukkah. Knowing little, we checked the web. Although I had my heart set on a sukkah that said "just add water," all of them said "some assembly required." For Brandon and me, that usually means an assembly we both ought not attend. Even more compelling, all said "some dollars required," in most cases the "some dollars required" meaning "fork over multiple hundreds, yiddishe boy!" Our new neighbor, also quite handy, came to our rescue with multiple plywood boards and cinder blocks. The boards were somewhat daunting and featured wood knots the size of supernovas, but at least I was familiar with cinder blocks, their having served as more or less the sole decoration for my dorm room the first three years of college. The some assembly yet required was not without its share of modestly banged fingers, scraped shins, and "where's the plug for the hammer, Dad?," but we managed to wedge the plywood between the cinder blocks, lay on the flat wooden top, and cover the whole thing with sheets which had long ago seen their better days. And so, a hovel-like structure arose! We next enlisted neighborhood children to make decorations, most of whom proved to be as artistically challenged as we were mechanically so. We added gourds and pumpkins, blessed the sukkah, and though some of our Jewish neighbors said it looked great "but when was it going to be finished?," we were ready to spend happy times there well in advance of the holiday. That is, well in advance of the rainy holiday! That year it rained the first five days of Sukkot, during which time we had to content ourselves with spending happy times admiring our handiwork getting drenched. By the time it dried out at the end of the holiday, though, we did get to enjoy a meal or two there. Sitting in the sukkah, gazing skyward, and chowing down on the traditional corned beef specials, french fries, and Coca-Cola from Murray's Delicatessen, I think we both felt a little bit proud of our achievement and maybe a little bit closer to our Jewish roots. Since then circumstances have intervened, and that was the last sukkah Brandon and I ever built. I'm still using the same excuse. "Y'know Bran," I say, "we live in kind of a smallish house and sometimes the roof leaks. That's just as ...."
No, it isn't just as good. We found that out the year we built the sukkah. sukkah - which I already explained above. You're good to go on this one! That makes me so happy, I could kiss a mezzuzah!